With the upswing of permaculture and food forests, perennials edibles like berries are on the rise and gardens like the Beacon Hill food forest are gaining momentum. And really… why not be able to eat the ornamental landscaping plants you’re already spending money on to keep alive? On top of all that, you can save even more moolah on your berries by purchasing them sans soil in the dormant cold season. During the wintertime, many edibles are dormant and don’t need soil to survive. As such, this makes them most pliable for shipping. Plus, since this is the first shipment coming direct from the grower for the season, you usually get the best selection of varieties and healthy plants. Sometimes nurseries or organizations like King Conservation District will even sell the bare root plants in bulk orders for an even better price—perfect for extensive landscaping projects. 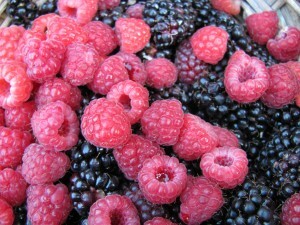 Plus, a bare root start could be better for your berries in the long-run. Cornell University did a study on root growth that showed bare root trees developing 200% more roots than those balled and wrapped in burlap. This is because the harvesting machinery for bare root trees allows for a larger root system than the spade used to dig up ball-burlap. You’ll also have the opportunity to really make sure your berries are planted at the correct level in the soil—which is to the point on the trunk where the roots flare out—and avoid any circling, girdling roots that could develop during container cultivation. We all probably recognize and appreciate the flavor of common fruits like blueberries, raspberries, blackberries and strawberries, which are all certainly abundant and delicious when homegrown. But there are many other berries on the nursery market that offer their own distinct flavor and nutritional profile, and some are even native to the Pacific Northwest and come with their own ethnobotanic history! Take for instance, the evergreen huckleberry: When planted in partial sun this glossy green shrub sets oodles of tiny black fruit all along the stems that make a pleasant and tasty popping sensation when placed in the mouth. As for ethnic appreciation, “evergreen huckleberries were well liked and people often traveled great distances to obtain them”. Other possibilities for native edible berries include the sour-sweet dull Oregon grape, the complex serviceberry, the variably flavored salal and the succulent thimbleberry—cousin to the raspberry we all know. Other non-native but delightful additions to the garden and plate are abundant and worth considering in your edible landscape. Thanks to innovative farmers, many varieties of blackberry and raspberry crosses are available, including marionberries, tayberries, boysenberries and loganberries. All are fleshy, juicy and full of vitamins and trace minerals. In the Ribes or currant family, closely related shrubs like the spiny-stemmed gooseberry, the thornless and sweeter jostaberry and a rainbow of currants, from red to white to black. Another nutritious oddity to add to your collection is the brightly colored seaberry or sea-buckthorn, which among other properties have seven times the vitamin C as lemons! Cranberries, another nutrition powerhouse, are also cultivatable in damp, acidic soil such as those found near wetlands though they can also do well in sandy soil with proper care. Of course, most gardeners know that winter is not usually the best time of year to transplant new flora. Often times these bare root berries will need to be stored properly until the soil warms up enough to become hospitable for root growth. It’s best to keep the roots moist and cool, so try wrapping them in damp newspaper or towels and storing them at around 30 to 35 degree Fahrenheit. Other options employed at some local nurseries are to store the plants with their roots in buckets of sawdust or even to gather potting soil and plant them in temporary containers until the time is right to move them into the ground. Before you plant, be sure to do an extra careful inspection of the roots for health and vitality. Look for any mildew smell or mold growing on the roots or stem, and if the plant looks compromised immediately return it to the nursery. This is especially important when you can’t inspect them in person, such as with mail-order berries. It’s best to begin preparing the soil nutrients in your future planting site up to a year before physically planting the berries. For instance, blueberries prefer acidic soil between 4.1-5.3 or so and could be best served with a sulphur amendment, while cane berries (i.e. raspberries) tend to grow best in a slightly acid to neutral pH like 5.8-6.8 and might need agricultural lime or sulphur added depending on soil test results. You may also need to amend the soil with some compost to speed up or slow down drainage if the area has historically had water retention issues. Residents of King County can get up to five soil tests per lifetime for free through the King Conservation District’s soil testing service. Contact the Garden Hotline with any questions about soil drainage and to learn about other local or inexpensive soil testing options. When the holes are prepared, you may begin placing individual plants. Be sure to spread out the roots and keep the root-trunk juncture at soil level as you backfill in the soil. In the end, the uppermost roots should be approximately ½” below the soil surface. With raspberries and other cane fruits, at this point you will prune the old cane to 4-6” above the ground to inspire new growth from the base. Lastly, you will use your hands to compress the soil lightly and form a slight basin shape in the root area to assist with water absorption. To learn more about food forests and proper selection and care for your bare root berries, please contact the Garden Hotline at (206) 633-0224 or www.gardenhotline.org. You can also find us on Facebook, Twitter and YouTube. Stevens, Michelle and Anderson, M. Kat. “Plant Guide: Evergreen Huckleberry Vaccinium ovatum.” USDA NRCS. 17 Jan 2001. <http://plants.usda.gov/plantguide/pdf/cs_vaov2.pdf>.